What we dare to imagine determines our future! In Luke 18:27 Jesus replied, "What is impossible with man is possible with God." There are only two possibilities: This is either true, or the God of this book is not real! This is a belief that will change everything about your future! What is impossible in the normal standard of human life, human intelligence, human ability, the laws of physics as they are normally understood and in the human physical realm--well, with God, it is quite possible! Jeremiah 32:27 says "I am the Lord, the God of all mankind. Is anything too hard for me?" You and I need to memorize Luke 18:27 and Jeremiah 32:27 and we need to ask ourselves "Is anything too hard for me?" When we are hurting and when things are not going our way, "Is anything too hard for me?" is not a question because most of the time our eyes are not on the Lord. They're on our checkbook, they are on our relational problems, they are on our children, or our parents, our schoolwork or job, but they are not on the Lord! When we are faced with the impossible, we need to understand that what seems so life suckingly important in this moment is not more important than my personal relationship with Jesus. So that's what I'll prioritize, and as I do that, I will face this challenge knowing that nothing is impossible with God! I will hear God say to me, “I am the Lord, the God of all mankind. Is anything too hard for me?" The truth is, the God of the Bible, the God of creation, the God who began everything in an impossible way, began it all with a word! The Bible says that in the beginning, God spoke and because He spoke, the impossible happened--something was created from nothing! When Jesus came onto the scene as the very heart and face of God on planet earth, He did the impossible from the beginning: water becomes wine, the blind see, the lame walk. Those who had never seen a sunrise saw God's mercy and grace and the beauty of creation in the touch of Jesus! Those who had never heard the voices of their loved ones or the songs of God in worship, with a word, with a touch, with a smile--the cripple walk and dance! I want us to imagine the road ahead because the truth is we need to redeem our imaginations! The word redeem is a critical word that has to do with 'buying back.' To redeem something means to turn it around, to make it right. It means for God to touch it and to move it from dark to light, from broken to whole, from bad to good. We were created in the image of God and a part of the power of our image is the imagination. It is the ability to see, in our minds, possibilities and to act on those possibilities. The simple truth is most of us here have allowed our imaginations to be run by the destructive agenda of hell more than the redeeming agenda of heaven. Our imaginations become the playground of all kinds of fearful, lightless, lustful, hopeless and failure-filled futures all because we do not have a mind filled with Christ! In Isaiah 65:2, here is the heart of God saying "All day long I have held out my hand to an obstinate people who walk in ways not good, pursuing their imaginations." You and I pursue our imaginations all the time; it's how we live. But if we can redeem our imaginations and buy them back from hell, and see a future that is hopeful and touched by the hand of God; fear goes, peace comes, and the course of our actions are redirected! Real faith imagines a future that is touched by God's hand in a way that changes it, redeems it, blesses it, protects it and makes it more than it ever could be! The hand of God throughout the Old Testament is incredibly powerful and the scripture says God stretched His hand out and when He does that –everything changes! That is the whole image of the hand of God: It is power, it is change, and it is the ability to make the impossible possible. I want to share with you a story in Mark 1:40-41, where the imagination changed everything. When Jesus came down from the mountainside, just finishing the Sermon on the Mount, large crowds followed Him and a man with leprosy came and knelt before Him and said, "Lord if you are willing, you can heal me and make me clean." Leprosy was the most horrible disease in the ancient world, it is a terrible disfiguring disease that made you socially unacceptable. Not only did you suffer the shame of being disfigured, you were spiritually and ceremonially unclean and could not worship. You lived life in shame, you lived life alone. 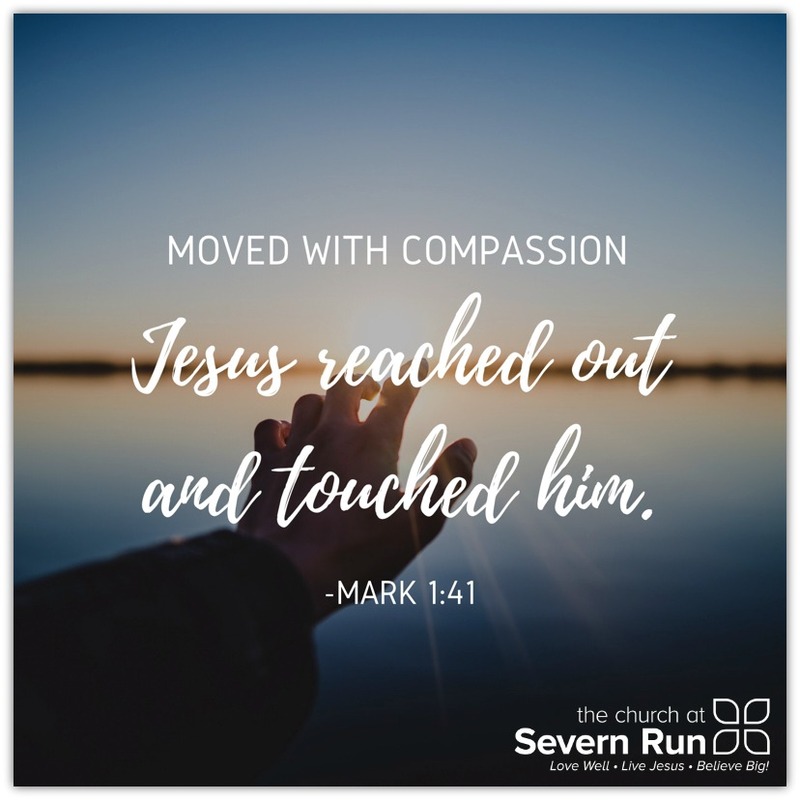 Jesus saw this leper and instead of running from Him like everyone else, the leper comes and kneels before Jesus and says "Lord if you are willing, you can make heal me and make me clean." This leper imagined a better life. This leper imagined the love of God. This leper imagined a healed future and a life that was restored to worship. This leper dared to imagine the good heart of God! Around us there are people who are unacceptable to us and we don't see them! As we talk about the need in our area that is ten minutes away in Baltimore City, we are one sitcom away from being able to go and invest in a way that changes worlds! So, you and I can sit down and watch one more thirty minute show or we can get in our cars and drive some place meaningful and be Jesus!